We host wedding ceremonies and receptions in our events building, the Garden Room, and its private garden. 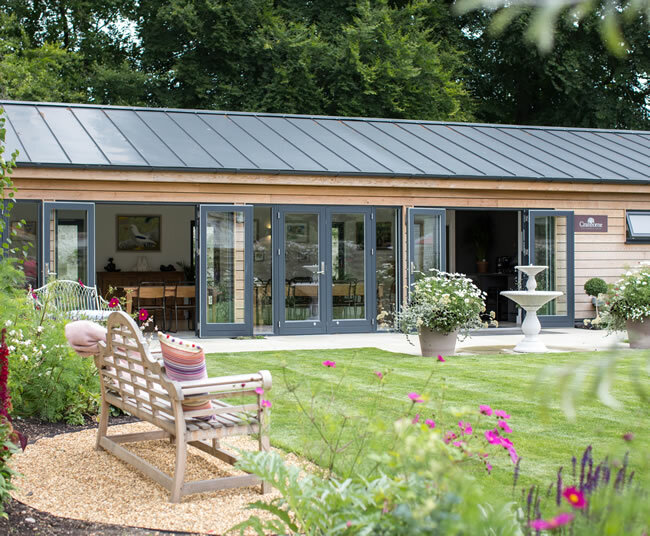 The Garden Room at Cranborne is set in the walled, former kitchen garden of Cranborne Manor, surrounded by stunning Dorset countryside in the heart of the Cranborne Chase. Our contemporary events building and its private English country garden provides a stunning venue in which we, working with our lovely team of local wedding suppliers, can tailor-make a unique and beautiful wedding reception to suit your individual requirements. Please download our brochure (PDF). For more information and to arrange a viewing, please contact Claire Whitehead weddings@cranbornegardencentre.co.uk or 01725 517248. We host wedding receptions on Thursdays, Fridays and Saturdays throughout the year. The Garden Room can seat up to 70 guests for a formal wedding breakfast or up to 85 for a more informal party. Larger parties of up to 120 guests can be accommodated within a marquee on the lawn. Cranborne village church is less than a 5 minute stroll away and Wimborne and Ringwood Registration Offices are both within 10 miles. We are licensed for Wedding Ceremonies, so you can marry in The Garden Room and host your wedding breakfast and party, although of course it is possible to hold either element as a stand-alone function. Cranborne village offers overnight accommodation to suit every budget. We believe that every wedding should be unique and personal to each couple. We also know that planning a big event can be time-consuming and stressful. Working with our team of approved local suppliers, we can tailor-make your day to provide catering, drinks, floristry, styling and all the little details just the way you would like them, to create a truly memorable day. If you already have your own suppliers, then you are welcome to use them too. Our wedding co-ordinator will work with you, taking care of the details, leaving you free to relax and enjoy a stress-free day. Our full brochure provides more details of our range of wedding services. Please contact us to obtain a copy of this and to arrange an initial meeting with our wedding co – ordinator. We really look forward to showing you around The Garden Room and to discussing your wedding plans.